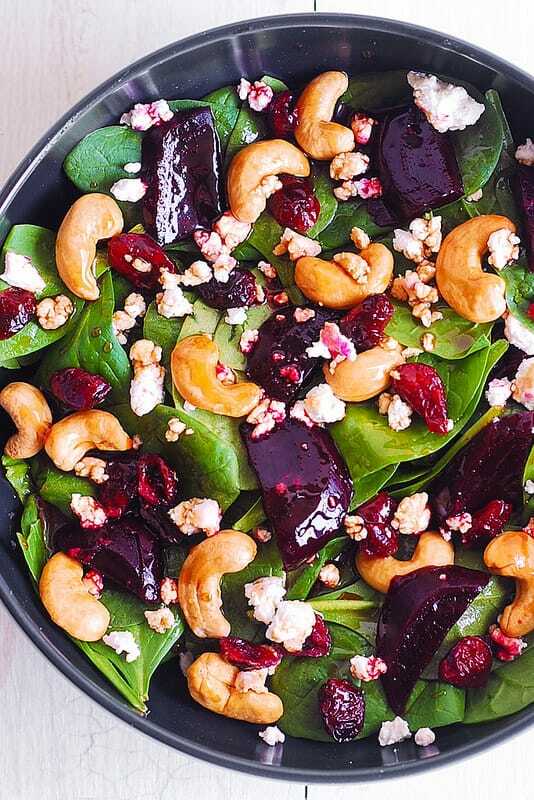 Beet Salad with Spinach, Cashews, Cranberries, and Goat Cheese with honey, lemon and olive oil dressing. Healthy, gluten free, Mediterranean-style salad, packed with fiber and nutrients. 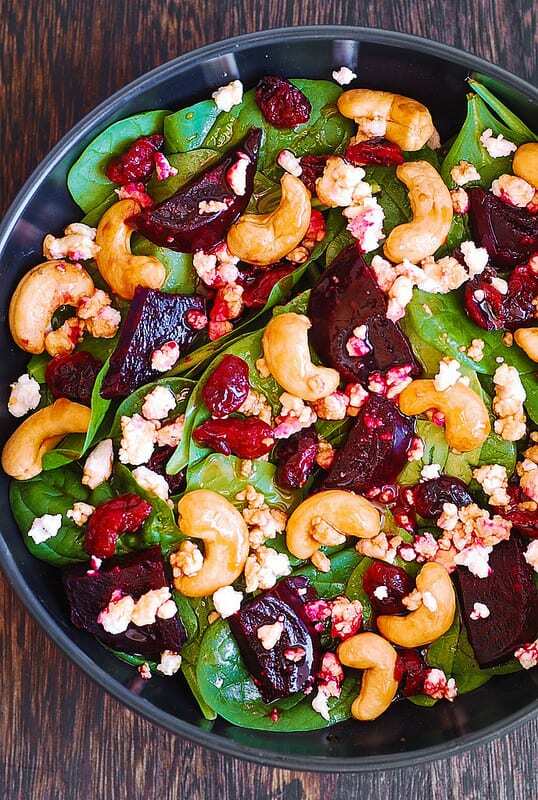 Goat cheese adds a touch of creaminess, while the cashews add a bit of crunch to this healthy beet salad. Beets have long been my secret love. I eat them all the time, and my husband jokes that if there is ever a shortage of beets it will be because I bought too many. Not only do I like how the beets taste, they are so good for you – you can read more about the benefits of beets in this article. I really should share more beet recipes, but the truth is I often eat beets plain. I boil them in the water until they are soft (about 20-30 minutes in boiling water), let them cool, peel them, and then I just eat them with some olive oil. And, often with some goat cheese. So, this time I decided to cook the beets not so plain. I made a beet salad. With goat cheese. And with spinach, cranberries, cashews, and a homemade salad dressing with honey, lemon and olive oil. 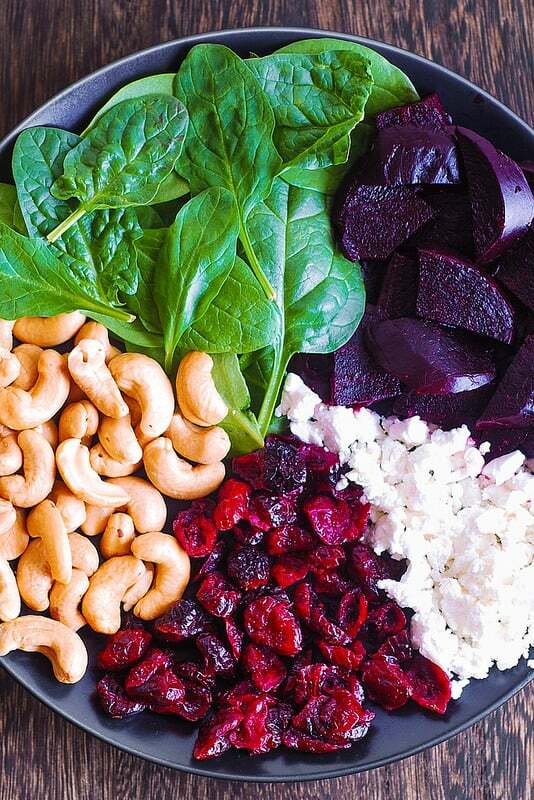 Add baby spinach, sliced cooked beets, roasted cashews, and dried cranberries to a large salad bowl. Combine salad dressing ingredients in a different bowl: olive oil, honey, lemon juice. Whisk until combined. Pour the salad dressing over the beet salad, and toss to combine. Top with crumbled goat cheese. This beet salad is so delicious and has so many ingredients that are good for you – I really recommend you make it! It’s so simple but has so much flavor! This salad is healthy, gluten free, full of fiber. 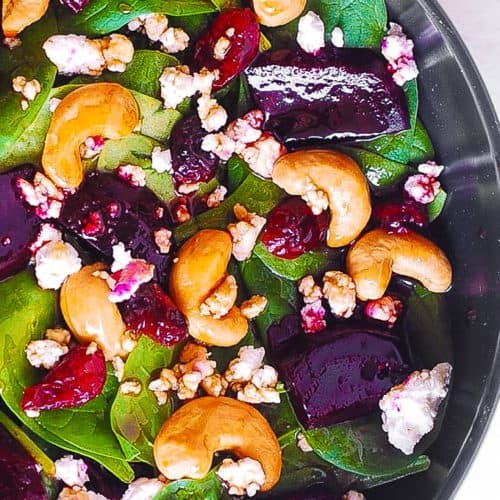 This spinach and beet salad is a perfect lunch or snack. It also looks really pretty, and will make a beautiful side dish to any dinner. 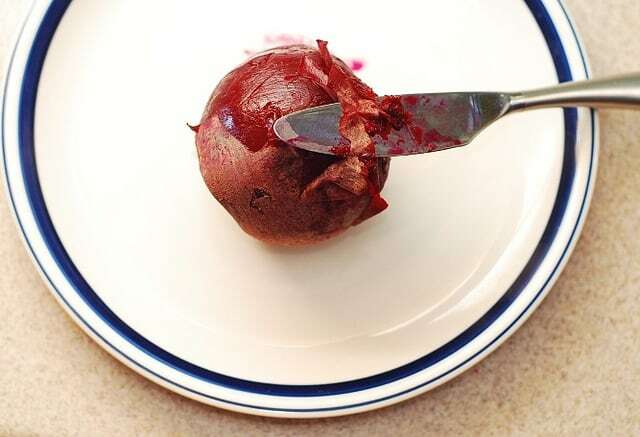 Place raw beets in a large sauce pan and cover with water. Bring to boil – it usually takes 10 minutes for the water with beets in my pan to start boiling. 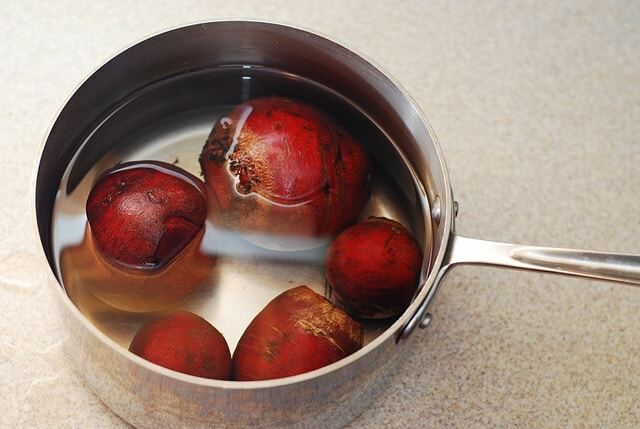 Once the water starts to boil, boil the beets for 20-30 minutes, depending on the thickness and the size of your beets. Next, carefully pour the hot water out and let the beets cool off (without lid on) for another 20 minutes. It’s important to pour the water out and remove the lid when cooling off the beets, otherwise they will get too soft. After that, beets are ready to be placed in an air tight container (or zip-lock) and be kept in the refrigerator. Note: While I usually boil all the beets for 20 minutes, you might have to boil them 10 minutes longer, especially if your beets are large, because the centers of large beets might not cook through in 20 minutes. But for small or medium size beets – 20 min is perfect! Goat cheese is not the only cheese that goes great with beets in a salad. Gorgonzola cheese tastes amazing with beets too: Arugula Salad with Beets and Gorgonzola cheese. Yes, I made the soup with beets, and it was delicious! I used Kefir to make this soup creamy: Beet Soup. And, yes, I made pasta with the goat cheese and beet sauce, too. It’s of a beautiful bright maroon color (all natural color, of course, from beets): Beet and Goat Cheese Fettuccine. Are you convinced yet that I love beets?! 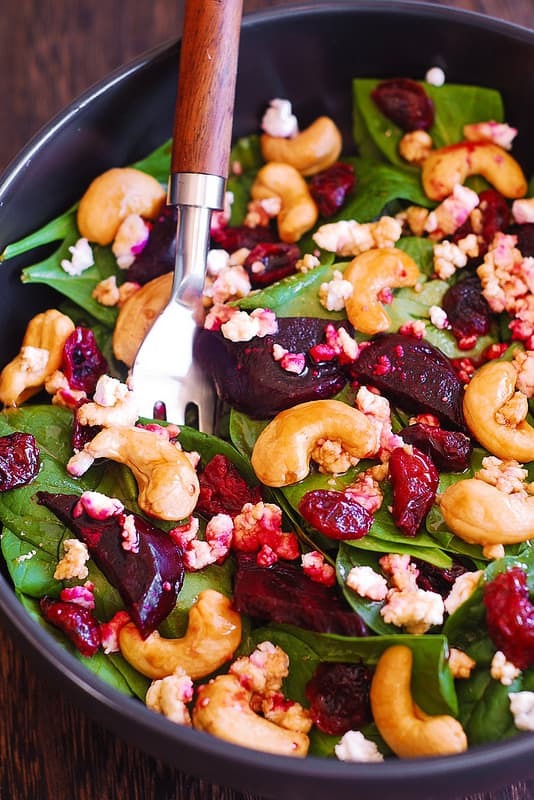 Beet Salad with Spinach, Cashews, Cranberries, and Goat Cheese with honey, lemon and olive oil dressing. Healthy, gluten free, Mediterranean-style salad, packed with fiber and nutrients. Pour the salad dressing over the beet salad, and mix. Do not add all of the salad dressing at once. Add just enough to coat the salad to your taste. You might use all of the dressing - you might not. Top your beet salad with crumbled goat cheese. Can you use pickled beets in this recipe, I am Canadian and we’ve love them pickled! Yes, you can use pickled beets in the salad! No, I usually boil beets without the lid on the pan. I’m allergic to honey. Could maple syrup be a substitute? Yes, you could use maple syrup instead of honey! Also good with mandarin oranges! This recipe looks like it will taste wonderful! I also love beets, and I eat them raw too! I grate them, and add them as a condiment to dishes too.